House crickets typically live outdoors and are especially fond of garbage dumps in warm weather. They are attracted to electric lights in larger numbers and will congregate on light poles and house walls. When cold weather approaches, they will shelter in houses seeking moisture and warmth. When seeking shelter, crickets will crawl through any crack or hole that allows them access inside. House crickets have been known to feed on and damage clothing, usually clothes that are soiled and await laundering. A cricket’s diet consists of plant and animal-based materials. 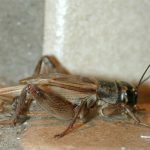 House crickets can gain entry into any home, but there are characteristics that will make your home more appealing to crickets. They are attracted to very bright lights so keep this in mind with exterior lighting. They are attracted to houses with moisture in the basement or crawl space. They thrive in the presence of cold, dark areas. They tend to have higher numbers for homes near garbage dumps. House crickets are attracted to the presence of wild bushes. Lastly, they are attracted to unclean, untidy environment – especially laundry soiled with perspiration.